With the hustle and bustle of the Holidays finding effortless recipes is essential; actually essential is probably an understatement! Truffles are wonderful festive treats to send to our loved ones; although they tend to need a candy thermometer and a little patience. I made a couple of batches of these orange infused truffles by doubling the recipe and within 30 minutes (most inactive time), gorgeous truffles! 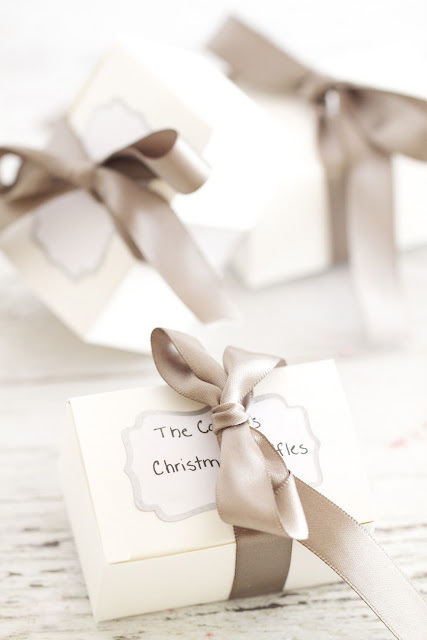 They create wonderful homemade gifts everyone will love. I know I adore homemade goods, especially when they are miniature, sightly less guilt. I bought the cute boxes, ribbon, candy cups (cupcake liners but extra small) and tags at Michaels. Extremely simple to put together and lovely. I hope everyone has a wonderful weekend! I'm going to be visiting my sisters, niece and nephew for a few days. Sadly this will be my last post for close to a week, but (happily!) I have some very talented food bloggers that will be taking my place and guest blogging on Epicurean Mom! I'm sure you all will enjoy them as much as I do! Return cream mixture to heat; bring to boil. Place chocolate in a heat-proof bowl. Remove cream mixture from heat. Pour through a sieve set over chocolate; discard solids. Stir until melted and smooth. Pour chocolate mixture onto the unlined baking pan, and spread in an even layer with an offset spatula. Transfer baking pan to freezer; chill chocolate until hardened but malleable, 15-20 minutes. Using a tablespoon, scrape enough chocolate from pan to form a roughly shaped ball (1-inch), if need be shape with hands. The truffles do not need to be perfect, be careful to overwork the chocolate or it will melt. 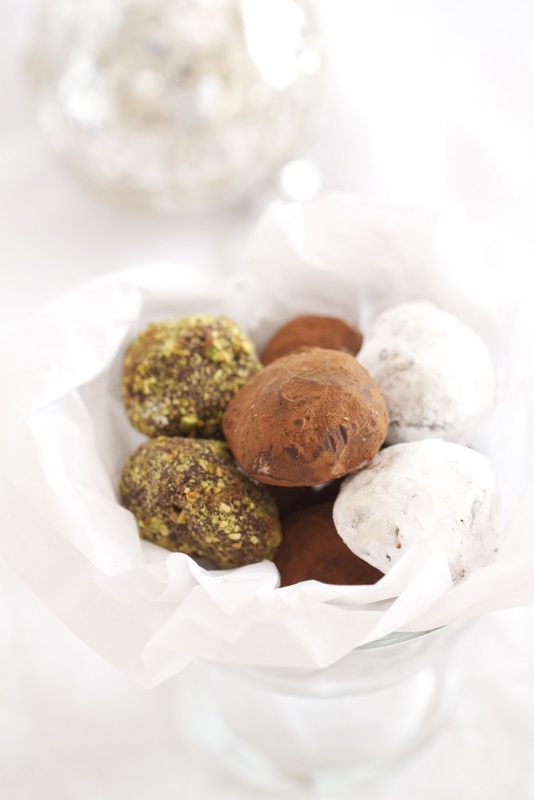 Transfer balls to the parchment-lined pan; chill truffles in the refrigerator for 10 minutes. 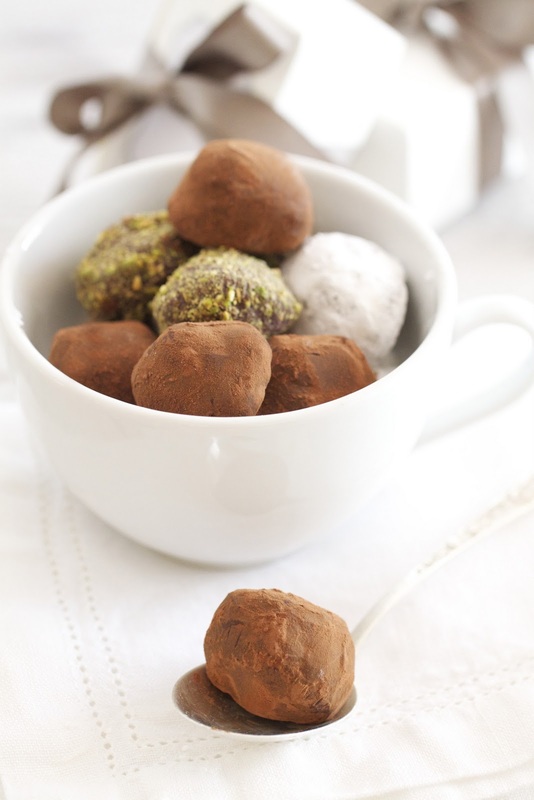 Place the coatings in separate bowls and roll each truffle in the desired coating. 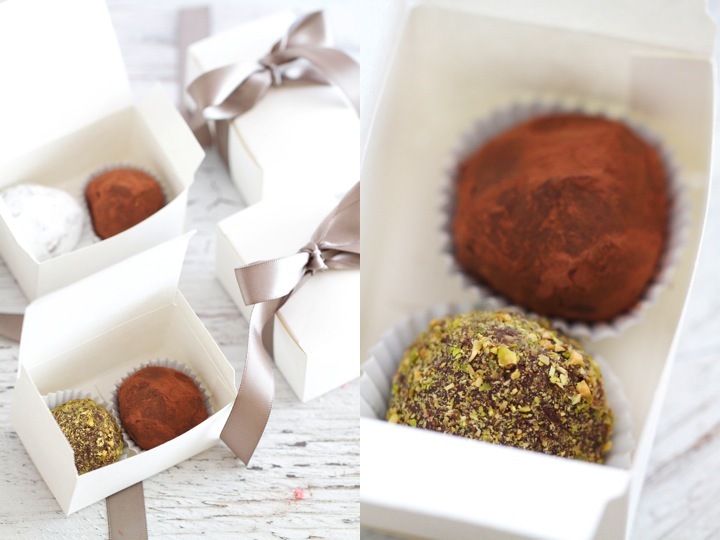 I have a weakness for truffles and these ones look perfect! Beautiful isn't even close to describing these. These are divine! Beautiful! Who wouldn't love receiving these delicious treats. Simple and delicious! A perfect holiday treat. Gorgeous! I am sending you my address so that you could mail me one of those boxes. lol. These are beautiful, Katie. What a fun gift! Wow, those pictures are absolutely amazing. The truffles look great too, but the pictures are just killing me. They're so light and airy and dreamland like, as weird as that sounds. They definitely belong on the cover of some food magazine.